The offshore and mining industries can be hazardous environments and the possibility of fire, flood, explosion and collapse has the potential to simultaneously affect a large number of people. When an emergency occurs, you need equipment you can rely on, lives may depend on it. 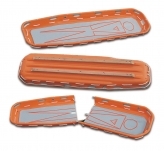 Ferno has a complete range of rescue equipment, proven in the field and used by the professionals.